8th ranked Mizzou softball plays host to the Columbia Regional for the fifth-straight season as it begins its quest for an NCAA Division I Softball Championship. The sixth-seeded Tigers are joined in the regional by Hofstra (43-11), Oregon State (33-22) and Stony Brook (35-23). Stony Brook enters the NCAA postseason with a 35-23 overall record and 10-8 mark in the American East Conference. The Seawolves are led offensively by sophomore infielder Bria Green, who has batted .355 this season with 18 doubles and seven home runs. The team leader in RBI is sophomore Shayla Giosia, who has driven in 35. Green trails her with 32 RBI. Stony Brook has three pitchers who have logged at least 100.0 innings in the circle, with sophomore Allison Cukrov leading the staff with 186.2 innings pitched for a 15-14 record and 2.74 ERA. For the year, Cukrov has struck out 147 batters and issued 82 walks. Junior Christine Lucido (117.0 IP) has compiled a 2.08 ERA with a 12-2 record, while freshman Jane Salen (100.0 IP) has pitched to an 8-7 record with a 3.08 ERA. Hofstra comes into the Columbia Regional with an overall record of 43-11 and 18-2 mark in the Colonial Athletic Association. Seven regular starters for the Pride have batted better than .300 for the 2013 season, with freshman catcher Caryn Bailey leading the way with a .373 average. Bailey has a team-leading 16 doubles. Senior outfielder Tessa Ziemba leads the team in home runs (13), while catcher Erin Trippi has a team-best 46 RBI. Hofstra is led by one of the top pitchers in the nation, senior Olivia Galati, who has thrown 307.0 of the Pride’s 351.1 innings pitched this season. Galati has pitched to a 37-10 record with a 1.39 ERA, striking out 374 batters and issuing 29 walks. Oregon State (33-22, 8-16 Pac-12) enters the NCAA tournament dropping five of its last six games, including a three-game sweep dealt by No. 5 Oregon. The Beavers are led by freshman first baseman Natalie Hampton’s .346 batting average and her team-best 15 home runs and 50 RBI. Hampton has slugged an outstanding .704 in 2013 and has an on-base percentage of .430. Senior outfielder Lea Cavestany is the next big bat for OSU, holding a .331 average with 10 home runs and 42 RBI. Two Oregon State pitchers have seen the bulk of the workload in 2013, with senior Marina Demore (168.2 IP) pitching to a 20-11 record and 3.03 ERA. Fellow senior Tina Andreana (127.1 IP) has compiled a 9-7 record with a 3.74 ERA. 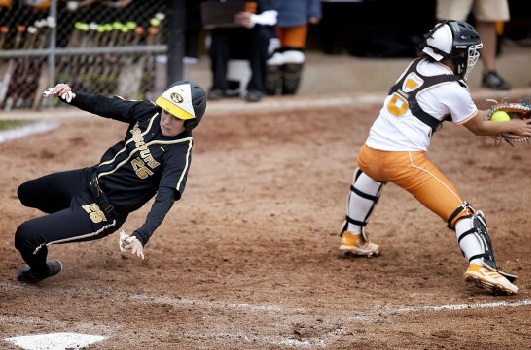 Mizzou ended the Southeastern Conference Softball Tournament (May 9-11) with a runner-up finish, posting a 2-1 record in its first appearance in the event. The Tigers, seeded third, started with a five-inning, 8-0 win over No. 6-seeded Arkansas on Friday, May 9, and took a 3-0 final from second-seeded Tennessee to advance to the SEC Tournament Championship, before dropping a 10-4 result to top seed and third-ranked Florida. Game One: Oregon State vs. Hofstra – 3 p.m.
Game Two: Mizzou vs. Stony Brook – 5:30 p.m.
Game Four: Loser G1 vs. Loser G2 (loser eliminated) – 2:30 p.m.
Game Five: Loser G3 vs. Winner G4 (loser eliminated) – 5 p.m.
Game Six: Winner G3 vs. Winner G5 – 1 p.m.
Game Seven (if necessary) – 3:30 p.m.